A form of the visitor pattern that walks a data structure using a common interface, retrieving the elements one by one without exposing the underlying representation. The iterator encapsulates the internal structure of how the iteration works. For example, if your program uses 4 different kinds of data structures - a tree, linked list, hash table and an array which all need to be processed by methods to sort, search and next (iterate one by one) then you would need a total of 12 different algorithms. Using an iterator this can be reduced to 7. The Iterator Pattern is also known under the name "Cursor". 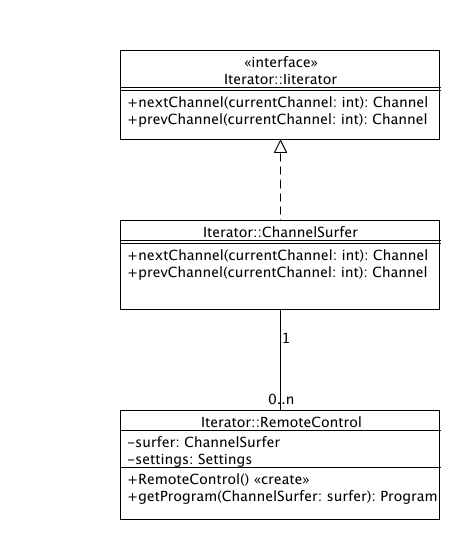 Visitor: The Iterator pattern is a form of the visitor pattern. The Composite pattern usually lets Iterators walk its data structure.